L'utilisation de la technique 'TOFD' a ete rendue plus facile par la production de logiciels complets. En plus, un travail considerable a ete effectue pour produire des norms operationnelles pour la technique. Ce papier decrit le logiciel disponible pour l'analyse, la mise en modele et le controle, et indique comment celui-ci est conforme aux normes. Use of the ultrasonic time of flight diffraction technique (TOFD) has eased by the production of the comprehensive data analysis software available on fully digitised ultrasonic systems such as Microplus and Zipscan. In parallel a British Standard has been produced to guide the application of TOFD and work is well underway towards the production of a first draft of a European standard. Making TOFD inspection easier encourages bigger inspection tasks which generate larger quantities of data. This data must be analysed, preferably on site. Can this data analysis process be streamlined to encourage its use on site? In addition the inspection must be set up so as to maximise its effect. This can be done in advance of the inspection but it is not uncommon that site conditions require a revision to the procedure - can simulation aid this process? Finally there is the question of the aptness of the technique - how will it perform? - are alternatives better? This paper describes some of the developments that have been carried out to ease decision making processes, to aid conformity with TOFD standards, to improve the speed of data analysis and to allow flaw growth monitoring. As the use of TOFD grew and became international there was a need for an application standard. The need was partly fulfilled by the document DD176 some time ago but this was only a draft and had no status as a 'real' standard. A period of work by TOFD users in the UK resulted in the publication of the new British Standard BS7706 - Calibration and Setting up of the Ultrasonic Time of Flight Diffraction TOFD Technique for the Detection, Location and Sizing of Flaws. This is a guide standard and thus contains a lot of detail about the technique in addition to the application requirements. It will have been available for about one year by the time of this Conference. It would normally be the intention to revise this document after a number of years, both to correct anomalies and to 'slim down' the text by concentrating on application requirements. However this was happily overtaken by the work, now already underway, to define a European standard for the technique. This document has already been circulated for comment within Europe and should be available quite soon as a Draft Standard. Model time delay curves - assuming no refraction at the probe index. Model time delay curves - assuming refraction at the probe index. 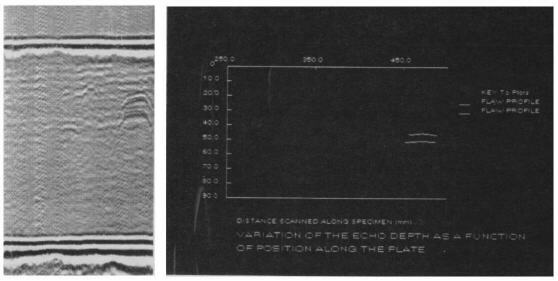 These calculations show the time delays and overlaps of the various echoes expected from the specimen. The first calculation is faster and valid when the probes are well separated. Model the migration of the probe index point with flaw depth. A specialised calculation to take index point movement into account when the probes are close together (or to confirm that this correction is not needed). Determine effective time standards for curved surfaces. To recalibrate the data input so as to take curved surfaces into account. Estimate the expected errors in the measurement. Estimates the magnitude of the main sources of error and the total error. Used to estimate error or as a guide to the best policy for reducing errors. 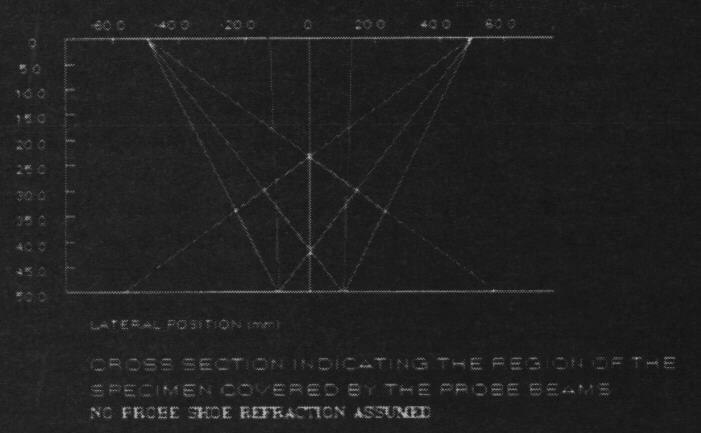 Estimate the coverage provided by the probe beam. Beam coverage - in tubes or cylinders. To determine whether al1 flaw locations are covered by the probe beams. Estimate the time profile of echoes prior to SAFT. Indicates potential flaw length resolution. Model time delay curves for the crystal edges. Highlights any problems with probe edge diffraction. Provide a visualisation of the working limits within the specimen. Highlights any limits on flaw detection - dead zones etc. Fig 1. Estimation of the Coverage Obtainable With a Defined TOFD Test Configuration. Fig 2. Estimate of the Time Profile Expected from a 20mm Long Rectangular Crack. The Profile from a Pore is also Depicted. These tools are kept under review and the range is expanded or an individual tool extended according to user feedback. Their main use is in planning inspections and in setting procedures but they form a particularly valuable aid if the inspection procedure has to be varied on site. In Figure 1 an example of the estimation of beam coverage is given. From this depiction decisions can be made to optimise the scan geometry or to increase the number of probes or scans. In Figure 2 an example of the time profile estimates for a rectangular crack and a pore are compared. Is this difference sufficient to allow the flaw to be detected or should the specification or test set up be changed? Another important aspect of defining an inspection procedure is the question of effectivity. For flaw sizing the use of the errors calculation mentioned in the previous section will define the performance and guide the way to improving performance. For flaw detection the aids package can help to highlight potential problems. The fundamental requirement, however, is an estimate of the probability of detection (POD) of defects. In particular, has the test technique and procedure been choosen. PoD estimation has been attempted from the analysis of practical results but the modelling of the flaw detection task has rarely been attempted. Two main elements affect PoD; the technique and the human factor. Human reliability has been studied and quantitative data is emerging. It is not very dependent on the precise action being undertaken and thus can to an extent be separated from the PoD associated with the technique. In choosing between techniques it is the comparison of the technique PoD's which is of greatest relevance. Within the NDT Centre software to estimate PoD has been produced for a number of techniques including the ultrasonic pulse echo and TOFD techniques. The performance of the techniques can thus be compared. For example, if flaws are growing normal to the back wall (corner reflectors), the only advantage of turning from pulse echo to TOFD is that detection and accurate sizing are possible in one measurement - fig 3. On the other hand, if the flaw angle varies, even by only up to 10 degrees from the vertical, the balance shifts towards the use of TOFD for flaw detection - fig 4. Fig 3. Estimates of PoD for TOFD and Pulse Echo Techniques. Flaws Assumed to be Open to Lower Surface and at an angle of 90 degrees. PE Calibration on 5 mm notch with Discrimination at 20% FSH. TOFD Calibration to BS7706. Fig 4. Estimates of PoD for TOFD and Pulse Echo Techniques. Flaws Assumed to be Open to Lower Surface and at an angle between 80 and 100 degrees. PE Calibration on 5 mm notch with Discrimination at 20% FSH. TOFD Calibration to BS7706. Pressures are increasing to complete data analysis on site or to provide a very rapid response if data is taken back for analysis. There may well be a lot of data to analyse and AEA Technology staff have regularly collected as much as 100 Mbytes of data from service work using TOFD or other techniques, which may comprise over 500 individual B-scan images. Experience shows that the majority of these images can be analysed with little difficulty provided that the operator is given software which can keep pace with the data collection and provided that the resultant data is readily interpretable by the client. B-scans are not satisfactory as the main means of appraising the client, simply because the principles of analysis are not readily explained and this may result in erroneous conclusions later. Simple representation of the flaws present. Speed improvement is not simply a matter of improving hardware or techniques. Often it is the interaction with the software which is time consuming - changing menus, selecting tasks etc. Use of the mouse gives better interaction but, with many B-scans to analyse, this is also a process which the operator would like to limit. There are few things yet to rival the human brain and eye combination for picking out likely defects but ideally interaction would be limited to this. When the analysis is complete the result should be a simple representation of the flaws which can be left with the customer. With these needs in mind software has been developed which is aimed at the rapid translation of data from the form of a TOFD B-scan to a simple presentation such as a cross-sectional chart or a tabulated list of flaw sizes. To commence the operator indicates potential flaws on the B-scan image. All flaws are highlighted since the separation of cracks from pores is a task for the software. The software then traces each designated echo through adjacent A-scans, producing a data array which represent the flaw profile in terms of time delay which can later be translated into depth. The data fitting step is indicated in fig 5. The synthetic aperture processing technique (SAFT) has become an adjunct of TOFD processing since it provides accurate estimates of flaw length; complementing TOFD which accurately determines flaw tip depth and flaw height. This process may take a few minutes and, to speed this up, an iterative processing technique has been developed which continues until the profile represents the best estimate of the true flaw shape. Despite the iteration the analysis is rapid and typically the analysis of an individual flaw profile is completed in less than 2 seconds on a 386 PC. The crux of the analysis is the estimation of flaw height. The errors likely in the estimate of the depth of flaw tips can be estimated, based on the scan parameters.The software is also capable of translating these into estimates of limits for flaw tip location . An optional display indicates the best estimate of the flaw tip position and also the upper and lower extremes for this based on experimental errors. The software produces a best estimate of the size and shape of the flaw and presents this on a cross-section of the specimen in the form shown in fig. 6. The character of each flaw tip is indicated by a colour coding. The flaw profile can be stored in this processed form allowing rapid data retrieval. IN this way data may be compared with stored data from a previous examination, providing an ability to closely monitor the flaw for any growth. With suitable preparation for the scans, growth of less than 0.5mm would be identified by this means. The introduction of standards for TOFD is easing the application of the technique and raising its profile as a realistic choice for all kinds of inspection. TOFD inspection procedures can be defined using a series of TOFD modelling tools. It is possible to estimate TOFD performance both in terms of sizing precision and probability of Detection (PoD). Rapid, routine TOFD analysis under site conditions is becoming possible as new software is finalised. The final data display is more readily understood by people not routinely involved with ultrasonics. Data may be stored and re-displayed in this form - providing a much firmer basis for the intercomparison of results from subsequent inspections via the monitoring option. This software is successful in increasing the throughput of data. It is not a replacement for existing software. It is a system that is more compatible with site analysis.